Welcome to the World of Chess! Chess is a game about hostilities. In this lesson you will meet the chess pieces, how to set up the board and learn the basic rules of play. You win the game when your opponent cannot move his/her King to safety. This is called checkmate. This lesson will explore the concepts of check and checkmate. Learn how to avoid having your King checked by using some clever tricks. Protect your King by moving him to a safe place in one of his "castles." Become an expert at the "King Slide." Discover the only time in chess that you can move two pieces in one turn. Become skilled at making good trades and avoiding bad trades. Is the Knight worth more than the Queen? Find the answer in this lesson. This lesson focuses on the basics of attacking and defending your chess pieces. Learn the advantages of using your pieces together to become a winning team against your foe's King. King of the Best Castle! 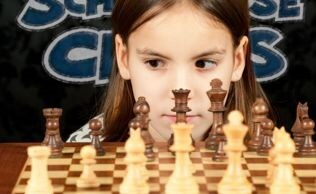 The theme of this lesson is basic strategy and controlling the center of the board. Learn where to build your castles and to use all of your pieces to protect your King. In this lesson you will be trained to see the right moves! With so many possible moves you want to be sure to make the best one. Your eyes and brain will combine to find and make the right move. Meet your mentor: "Chad"
Meet a Master: Paul Morphy! Meet one of the greatest natural chess geniuses in history. Learn his story while reviewing all you have learned in Schoolhouse Chess classes.